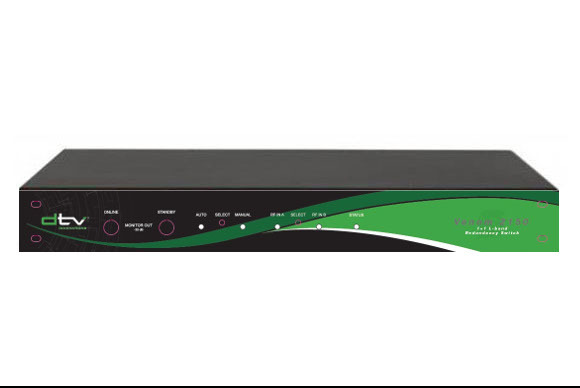 The Venom 2150 is a professional grade, state-of-the-art, and high availability L-band Redundancy Switch providing 1:1 redundancy protection for modulators. The switch is designed for operation with any modulator providing alarm contacts such as DTV Innovations’ Vyper 7 stand-alone modulators or the optional internal modulators, offered for the Gryphon family of video encoders. The two 15-pin D-sub connectors can also be used with a variety of modulators from other manufacturers. The switch operates in either a manual or an automatic mode for redundancy switching between the two RF inputs. When a failure is detected in automatic mode, the switchover is very rapid with a typical switching time of 100 ms and guaranteed maximum switching time of 250 ms. While in manual operation mode, the front panel switch allows the RF input to be manually controlled. The front panel LED indicators display the health status of the unit and indicate the RF input that is routed to the primary output of the switch. The alarm output connector provides status to an external network management system or can be used to trigger an external audible or visual indicator that an event has occurred. The Venom 2150 switch includes dual, redundant power supplies with separate AC inputs for high reliability. Inside the chassis are two power supplies that operate independently so the redundancy switch will continue operating even if one of the power supplies fails. This results in an MTBF greater than one million hours, providing peace-of-mind for mission critical applications where even a few minutes of downtime could represent thousands or even millions of dollars in lost revenue.